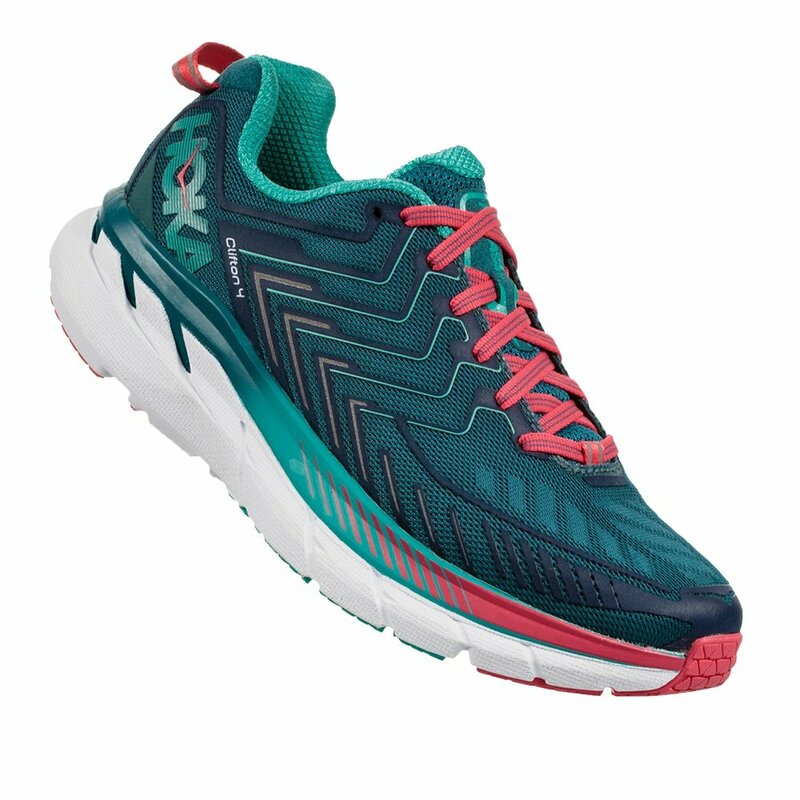 Designed to give you comfortable cushion without slowing you down, the HOKA One One Clifton 4 Women's Running Shoe is set to help you log miles without really feeling them. The Early-Stage Meta-Rocker is built into the plush EVA midsole to give you easier transitions to the power part of your stride, and there's rubber reinforcement in key areas for durable grip without unnecessary weight. Up top is designed for comfort too, with Open Engineered Mesh Construction providing support and protection while remaining highly breathable. "whats the difference between w and a B in width"
"Thank you for your inquiry. W is the Common Abbreviation for a Wide Width. And B is your standard or narrow Width. We hope this information helps! " Let me preface this by saying, I'm not a runner. I'm just a person who is abysmally difficult to fit for shoes. I'm a severe supinator with wide toes (Roman style) a high arch, and a tall instep. I bought these a few days ago from my local running shoe store (Portland Running Company < 3) in size 9.5 wide and in the last 5 days, my knee pain has almost disappeared. I walk much more quickly in these shoes with a longer stride and more stronger push off through the toe. Best of all, I don't feel like all of the effort I put into walking gets wasted via absorption into the padding. The responsiveness of the cushioning gives a great bounce to my step. These are the most comfortable shoes I've ever worn. I love them. And I'll probably buy more. I might even start running... maybe. I was very excited to hear Clifton 4 was getting a mesh upper, because my issue has usually been the width of the toebox. Clifton 3 was not horrible (Clifton 1 was the worst), but I was hoping for even better and mesh upper sounded very promising. It felt good wearing it initially, toes could expand more comfortably, but 3 miles into my first run, I felt the inner edge jamming into my arch. See the image of the mark it left on my foot, which hasn't faded even 8 hours later. This is guaranteed to turn into a blister next time I wear these. The same happened to me with the Infinite. Why oh why did HOKA have to mess with this shoe so much. Feet felt heavy wearing them. I had to make a return. Nothing wrong with website or transaction though. Great shoes! I would buy them again! These shoes are great for walking. I bought my first pair when preparing for a trip to Europe. I knew I would be walking a lot and on uneven cobblestone streets. These shoes did all I wanted and more. I recently started jogging outdoors, mostly on sidewalks. My shins hurt terribly so i researched a bit too find a better shoe for my needs. I chose this one and write are they ever comfortable! No pain at all street my run in these! The best athletic shoe I have ever worn! Hoka is the only athletic shoe I will buy, you get what you pay for. I walk my dog 3-5 miles a day and needed a better walking shoe. This fits the bill. My first ones felt great, these feel like they were sewn wrong or poorly I can't quite explain but I can't wait to take them off after just walking around the house in them. I put on the old hokas and I'm relieved. It's a quality issue from the shoe I believe but I can't pinpoint it. I thought I was helping myself by purchasing online. I was wrong. I just order the newest color when I am ready. I wore Hokas for an Ironman and they were great. They are great for cushioning as I get older. Wear this for daily gym classes and workouts. Fabulous support and comfort!! I had been having pain on the ball of my foot but with these sneakers, there is no pain and I can walk all day. Thanks so much!!! I love the rocker base and how springy these are. They are surprisingly light. With narrow feet I do feel the one thing I'd love more is if they were slightly narrower. I'm constantly trying to tighten the laces. I don't do super high mileage but I feel the sole is wearing out quicker than usual. I wonder if that's because the material is so light. In any case, I'm a fan. I have chronic achilles problems and I feel like they may help with that because of the rocker base propelling you forward efficiently. Lots of cushion for impact. This shoe is great! I wear for everyday use and can also run in them. I usually wear the Bondhi to run, but these work too. Best shoe I have ever purchased! I am a college athlete so workouts can be strenuous. My clifton 4's have held up to my expectations and even more! I would definitely recommend these to anybody who is looking for a good solid workout shoe excited to order my next pair! These are the most comfortable running shoes I have owned. I highly recommend them. The black Bondi 5 looks so clunky and unattractive as the entire shoe is black, that I went with the Clifton 4. The white on the sole makes the shoe look less padded than it is. This shoe is comfortable but does not have the cushy, wide foot bed that the Bondi does. However, it is nice looking and offers good support on hard surfaces. Why is the toe box so narrow?? The difference in the toe box between the 3 and the 4 is significant. I feel that I have a narrow foot and the 4's rub my toes until they are numb. I have heard others complain about the toe box being too narrow. I contacted Hoka directly and was told that the 5's had "no change" to the width of the toe box as they followed their reviews to make "other" changes. So here I am--leaving this review hoping you will give the next version a roomier toe box. For now I will have to switch brands to find what I need, though I doubt I will find any cushioning to be as good as a Hoka.